While I’m waiting for our newly refinished floor to cure so that I can finish the stenciling and move in to my new room, I thought I’d share some of the more intricate treasures in the house with you more closely. 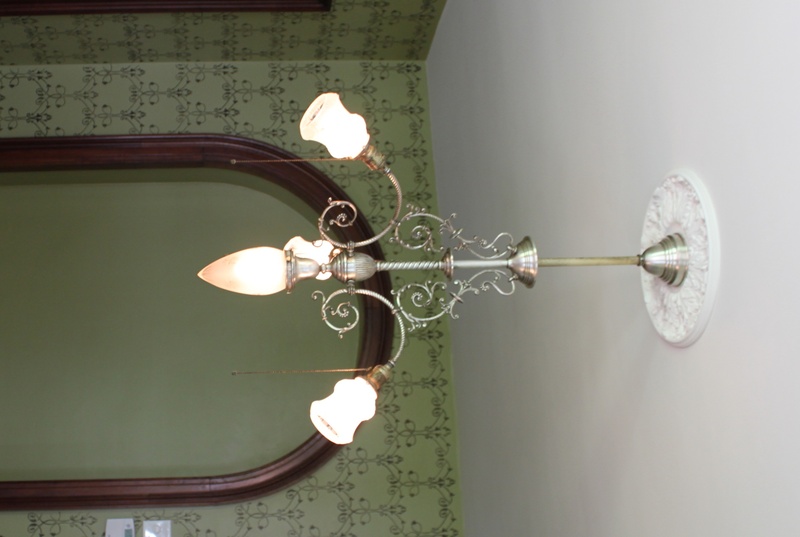 Although our house is not the typical over the top Victorian that one may think of when they hear the word Victorian, the Queen Anne style certainly suits our tastes and the detailing that we do have is superb. 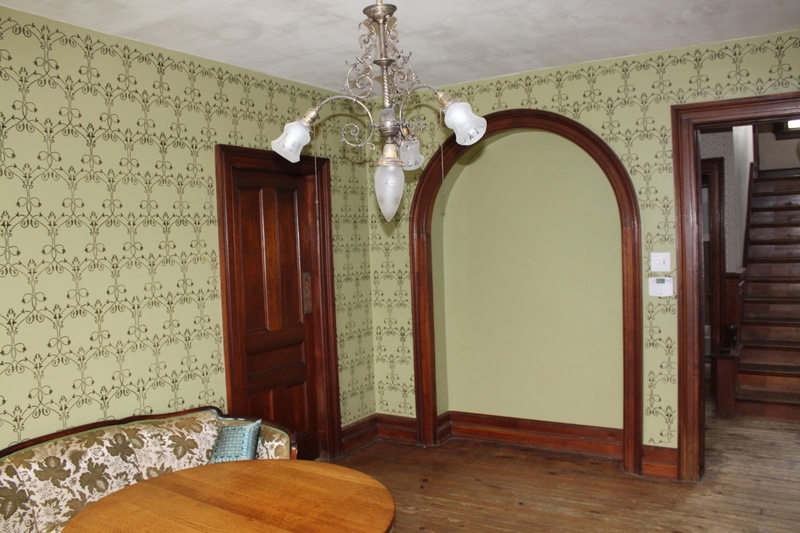 We have both mentioned the woodwork in the downstairs and front hallway before, solid cherry paneling. 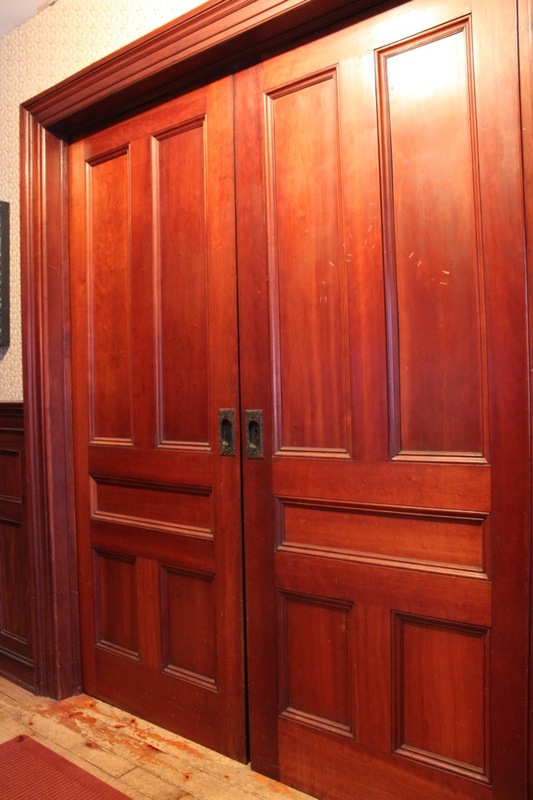 I think we have also mentioned that there are sliding pocket doors downstairs, seven to be exact. The difficult piece for us in this is the work we’ll need to do to get them all rolling again. Only three of them work smoothly, but we have figured out how to repair them without damaging or even taking apart the woodwork. The tracks that the doors live on can be raised and lowered within each housing case, and once we start working on a set, Bill will likely take you through the process on how we can maneuver them. Each door has beautiful hardware inset handles and locks. When we first came to the house, I had assumed that this hardware was bronze. To my surprise, when polished, it is a rose colored brass or copper plated. I can’t polish all of the hardware fully, so as not to wear down the plating, but fresh lime juice and sea salt work wonders. My favorite piece of hardware so far is the push plate on the swinging door between the pantry and the dining room. I think we’ve been very lucky that so much of the hardware is intact and in good shape. Many houses are stripped of the hardware simply because of its worth. Along with the door and window hardware, the floor hardware is stunning. Yes, the floor hardware. 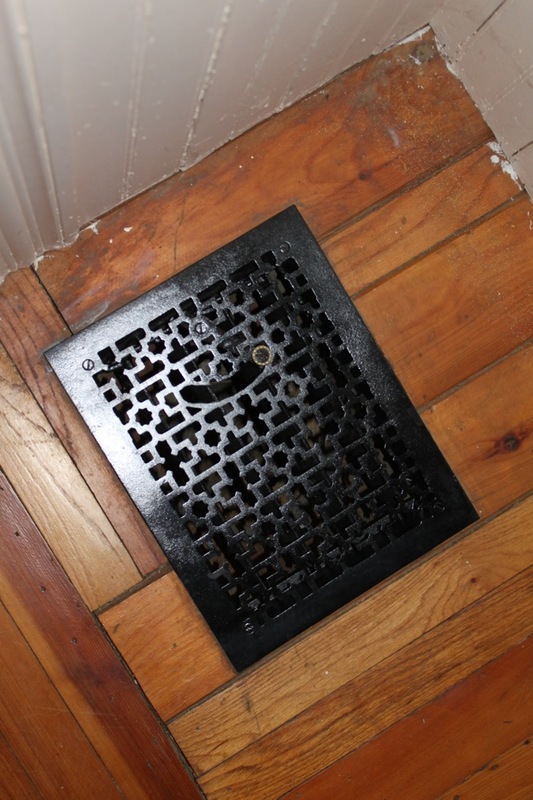 We have heavy iron floor registers in each room leading to our basement oil furnace. Actually, my studio register is not connected to anything, thus leaving that room with no heat. But, in all other rooms, there is a large register. In only room is the register in the wall, and I believe we have three types of registers. Most of them are quite large and replaceable if we ever needed to get a new one. However, to replace a single register alone would cost $300. For each room that we have worked in, we’ve cleaned and repainted the registers. Mostly they are dull and rusty, but shine up quite nicely with high gloss black paint. 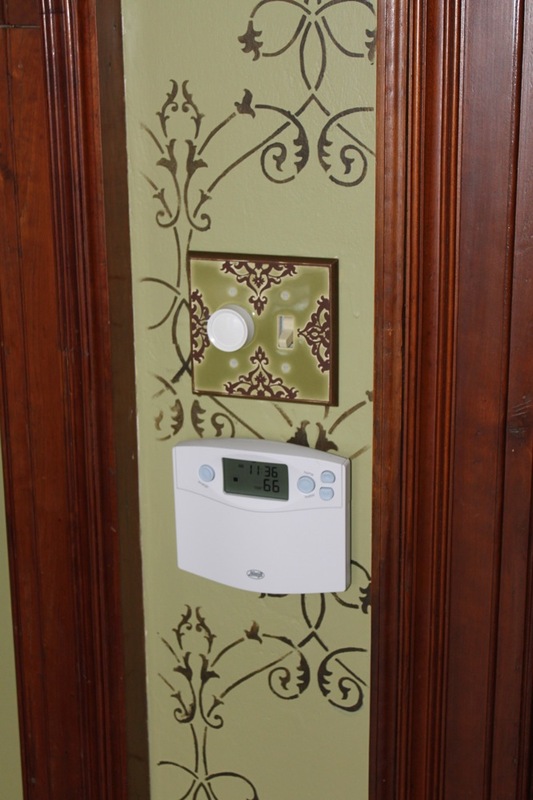 Once again, Vandyke’s Restorers is our go to place for finding any hardware replacements. I’ve had to buy window sash locks and strike plates through them, and we have appreciated the quality they serve up. Not all of the glorious details we’ve found have originated in the house itself. As we go, (slowly), we are adding tidbits to each room to make them unique and sassy. The Victorian era was full of flourish and mismatched floral patterns. 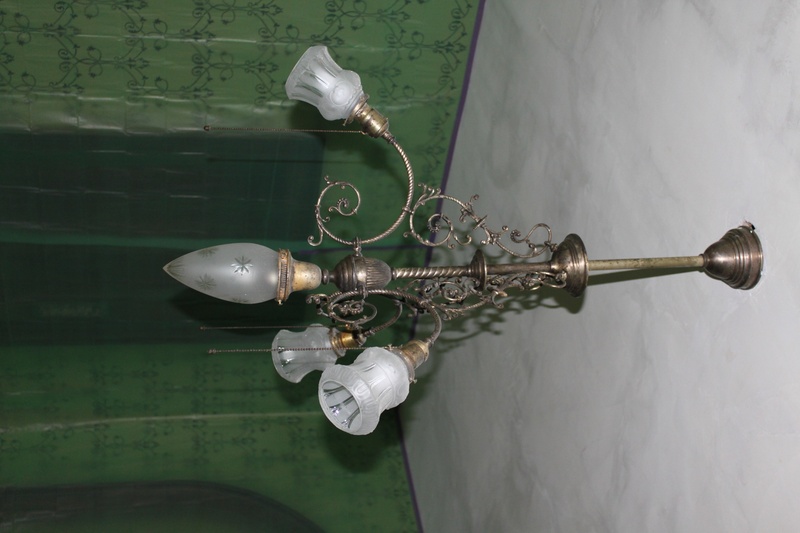 I can’t say that we’ll end up with a house reeking of 1890, but I can say that we are intending to create an updated Victorian feel. This past holiday, in a small art co-op in South Carolina, we came upon a perfect detail to add to our dining room. A porcelain switch plate, painted ideally for our already stenciled walls. I was in shock when I found it and bought it without hesitation. I’ve even thought of writing the company to let them know how perfect it is for us. Take a peek, the company that makes these plates is called “Now that’s a switch“. More details to come, as we continue to unfold! set in the room. The walls were patched, and the undercoat was a dirty yellow. But, its a HUGE room, with three large windows at one end and a curved cove at the other. Yes, the light appears to be original, too. And so, the real work began. We have to re-paint and repair all of the rooms downstairs before we can refinish the floors, and that is another post of course. I chose a soft lime sage green for the base coat. We had to patch and prime the entire room and ceiling beforehand, though. What we didn’t know at the time, however, was that the ceiling had been wallpapered at one time. That old glue showed up much later, after the whole room had been completed and the ceiling started to peel. Thankfully, it was our first ceiling, so re-doing it was more of a lesson learned well than anything. Bill is still working on that part, but should be done in the next few weeks. 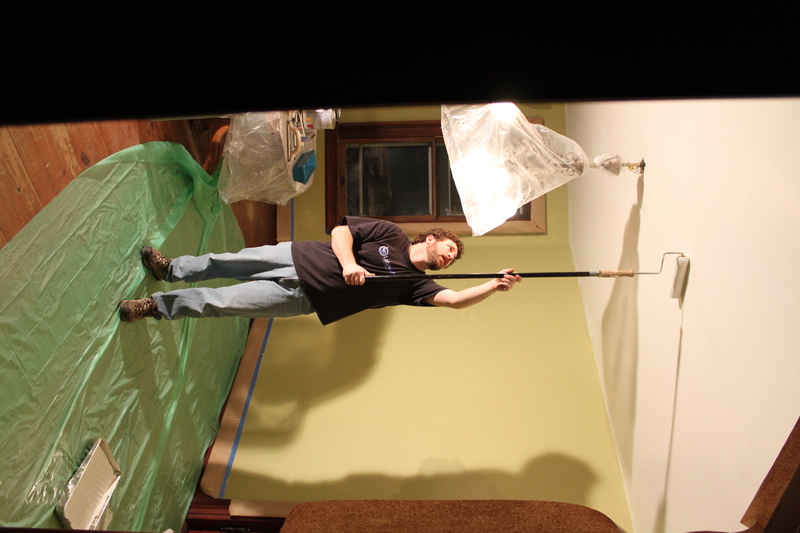 Painting the room was a quick process, but the stenciling took about 6 weeks or so. It was well worth it. 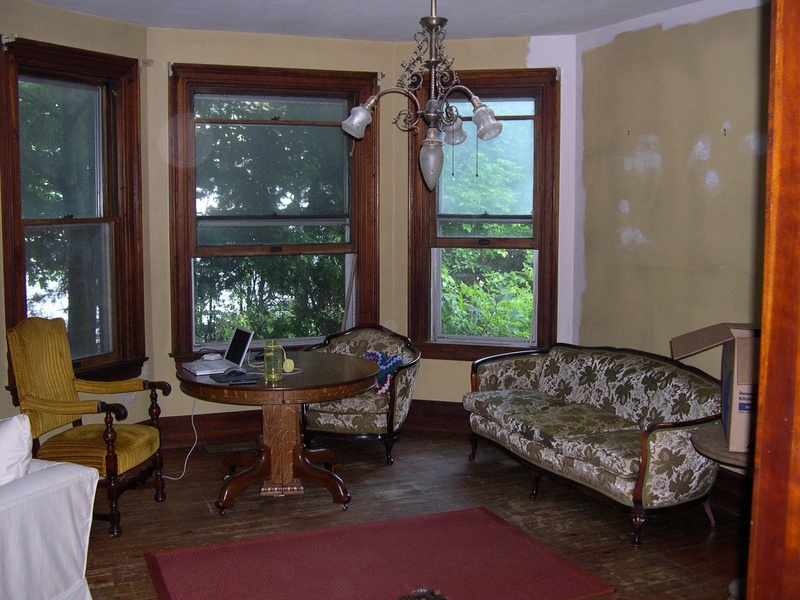 Though you can’t tell from these photos, we fixed all the windows, cleaned the hardware and the woodwork. 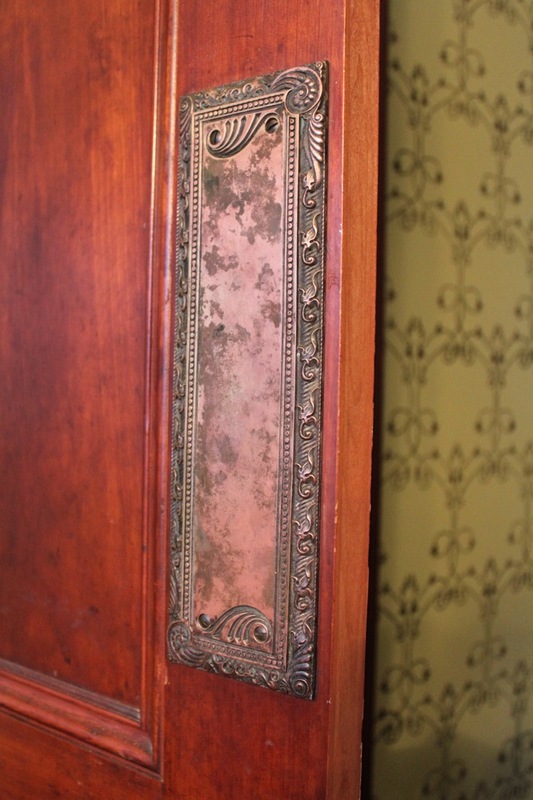 Most of the original hardware appears to be either copper or a rose colored bronze. Most, if not all the windows in the house are dual hung, so that the sashes open from the top and the bottom. We have replaced all the cords here in the dining room, so they are all completely functional. 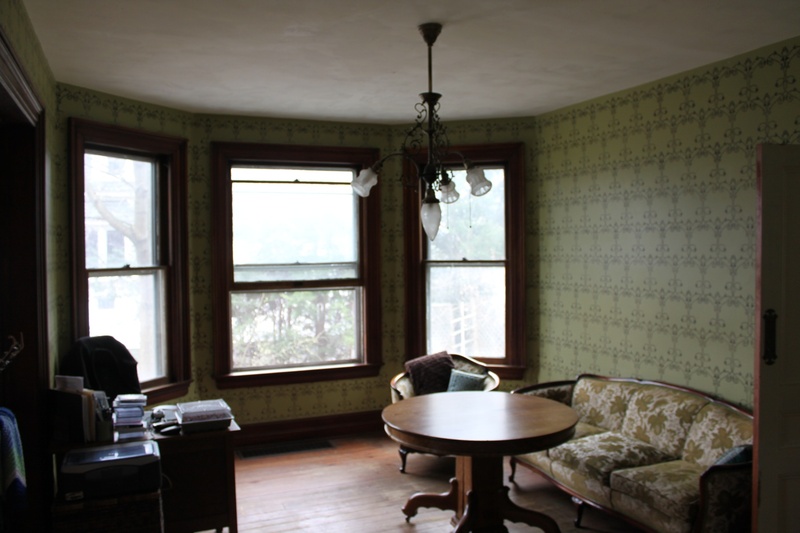 The second phase of the dining room will involved refinishing the floors and getting real furniture. Might be a ways off. Our last piece of the dining room came as a bit of a surprise to both of us. Bill actually finished the ceiling while I was away this past week and we both decided that the light needed a little something. So, we planned to put a plaster medallion in place around the base, and I thought I could clean the fixture while it was down. Originally, I had thought it was plated with brass or gold and needed to be re-done. However, with a closer look and some cleaning, I discovered that it was silver! And, might not be just silver plate, either. 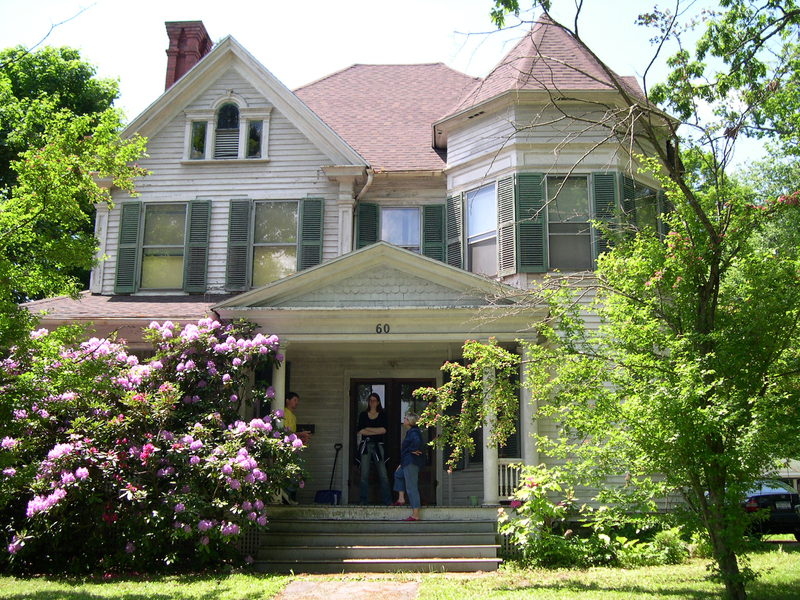 Check out the before and after! Woo hoo, another sweet surprise that the house holds. Dining room light before cleaning. . .